King Buck Safaris Saskatchewan Manitoba Lodge - Record Trophy Big Game Hunting! taken in the wild at King Buck Safaris! Click HERE to see photos of Saskatchewan deer hunting tree stands. "Outfitting is a way of life!" I've trapped, hunted and guided in Manitoba's North Interlake for the past 30 years and 10 years in Saskatchewan. I have been successful in gathering lifetime opportunities for both myself and my clients in archery and rifle seasons. These include Black Bear, weighing up to 737 lbs. (2112/16"skull), whitetail in 190 lbs. class – non-typical in the 210 class, plus Moose in the 210 B/C Class. Our professional guide, with years of hunting and guiding experience, ensures a sucessful and memorable hunt. "Absolutely outstanding" is the only way to describe an adventure with King Buck Safaris in Manitoba's Interlake Region. We also hunt in Saskatchewan which is famous for it's large Whitetail Deer (current Boone & Crockett world record for typical whitetail deer - Milo Hanson, harvested in Saskatchewan, - SCORE: 213-5/8). "Our Success is Your Success"
WHITETAIL DEER OUTFITTERS NOTE: Points to consider before booking your next whitetail deer hunt. (1) Reputation: Look for someone who is honest and reputable. There are alot of whitetail deer outfitters that blow steam up your *** and tell you what you want to hear and not the truth. Always remember your average whitetail deer in Manitoba and Saskatchewan is a 130-140 class animal. If you have someone telling you 150B/C IS AN AVERAGE WHITETAIL DEER taken in his or her camp then "BUYER BEWARE". (3) Check out the web site A website should be up-dated every year and it will show the avid deer hunter the quality of deer taken in his or her camp, but also one must take into account that every year is not a perfect year for every whitetail deer outfitter. Weather, deer rut, clients accuracy etc. are all contributing factors to a successful whitetail hunt in Manitoba or Saskatchewan. If the whitetail deer outfitter has only 120-130 class deer on his website or no photos of quality animals for at least three consecutive years then "BUYER BEWARE". This whitetail deer outfitter is not working towards your successful trophy whitetail hunt, his interests are only in your money. I do not have to say any more. (4) Surf the web for trophy rooms, don't be fooled by photos. Ask the outfitter for phone #'s for particular deer photo references and phone the client to see if he actually hunted deer with that outfitter. (5) Booking Agents: Whitetail booking agents are like whitetail outfitters. There are good ones who strive to be #1 out there, like myself, and there are bad ones who are only interested in your money. A booking agent should be just a whitetail deer booking agent and not one who is both an outfitter and a booking agent from any of the Canadian provinces: Saskatchewan, Manitoba or Ontario etc. If you are a serious whitetail deer outfitter then you have no time to book hunts for someone else. It takes lots of scouting, hard work and strong dedication to operate a successful whitetail deer operation with client opportunities on world class deer. If anyone knows, I do. If anyone is interested in obtaining an opportunity on a trophy whitetail deer through a booking agent, choose one that only books deer hunts for two or three deer outfitters in a particular province, not one who represents 6-8 deer outfitters for one province. Also your booking agent should have some deer photos of trophy whitetail taken with that particular outfitter. These Deer Photos should be next to the Deer Outfitters he or she is representing. Ask for your interested deer outfitter's website address. If the booking agent doesn't want to give it to you and if the whitetail booking agent doesn't have all of the above qualities then "Buyer Beware"! - their interest lies only in one thing and that's your money. If a booking agent is an outfitter and also a whitetail deer booking agent, wouldn't you, as an outfitter, only want to promote your own whitetail operation and area? Any booking agent representing 6-8 whitetail outfitters in any one province who is also an outfitter will never have all the knowledge of how all these individual deer operations are run. Do you think that this whitetail deer booking agent would have hunted deer with all of these whitetail outfitters that he or she is representing? Being a "competitor" to these represented outfitters, do you think they would allow him/her full information on their own business? My answer is a resounding "no"! What is yours? Once again "BUYER BEWARE"! These booking agents are only interested in one thing - and that is your money! (1) - Gives everyone valuable advice. (2) - Promotes and markets the outfitter. (3) - Are well organized and structured, usually showing that the outfitter takes pride and is serious about his business. (4) - Has plenty of quality photos which shows great success and speaks for the operation. In conclusion, one more important factor in selecting a whitetail outfitter is talking to the outfitter himself. If he or she shows enthusiasim, answers all of your questions, is willing to send you information and a long reference list of successful and unsuccessful clients - then he's probably trustworthy and deserving of having your business. Give yourself plenty of time to do your research thoroughly. Remember... this is your hunt and your money so choose your hunt wisely. I wish readers all of the best, with great success on their next hunt! 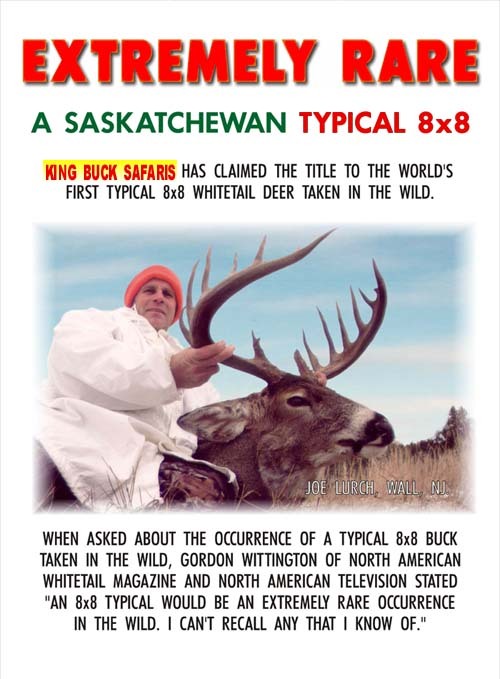 After watching the deer footage here at King Buck Safaris Lodge in Hudson Bay, Saskatchewan I'm almost 99% certain that the Hanson Buck was beaten if Charles Nicozia would have capitalized on his opportunity. I have never seen deer footage taken in the wild of such a symetrical 7X7 with at least 12-13" G2's G3's G4's and G5's. What an incredible,incredible deer. The Whitetail Deer's rack is at the very least one and a half feet above its head. This is a piece of deer footage that every hunter should be entitled to see. " "INCREDIBLE GENETICS" within the whitetail deer hunting area of King Buck Safaris. 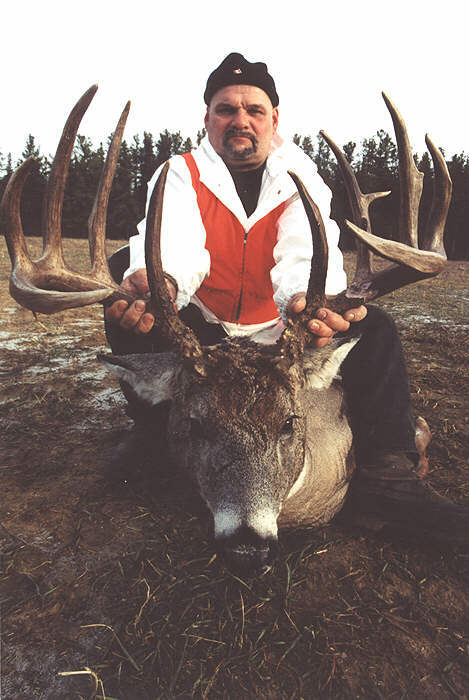 But all of you hunters remember that this deer footage would have never existed if Larry, who owns and operates King Buck Safaris and 1-AAA Absolute Accurate Adventures hadn't done his homework to give Charles Nicosia an unforgetable opportunity on this magnificent 7X7 giant in Saskatchewan. This deer outfitter does not depend on his guides to do the work in the pristine forests of Saskatchewan. All whitetail deer stands are set up by Larry himself.